Charles Beseler Company is an American company founded in 1868 by Charles Beseler, which began to sell photographic products in 1953. 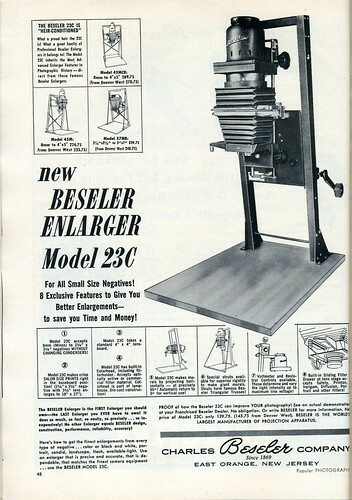 It is mainly known for its enlargers but also made a 4×5in press camera around 1960, and imported Tōkyō Kōgaku cameras in the 1950s and 1960s, some of which were sold under the Beseler brand. The company is still active (2018) and sells enlargers and darkroom accessories. ↑ Official company history (archived). This page was last edited on 6 November 2018, at 06:24.